Tomorrow, April 12th, is Drop Everything and Read Day, an annual celebration of the joys of reading. 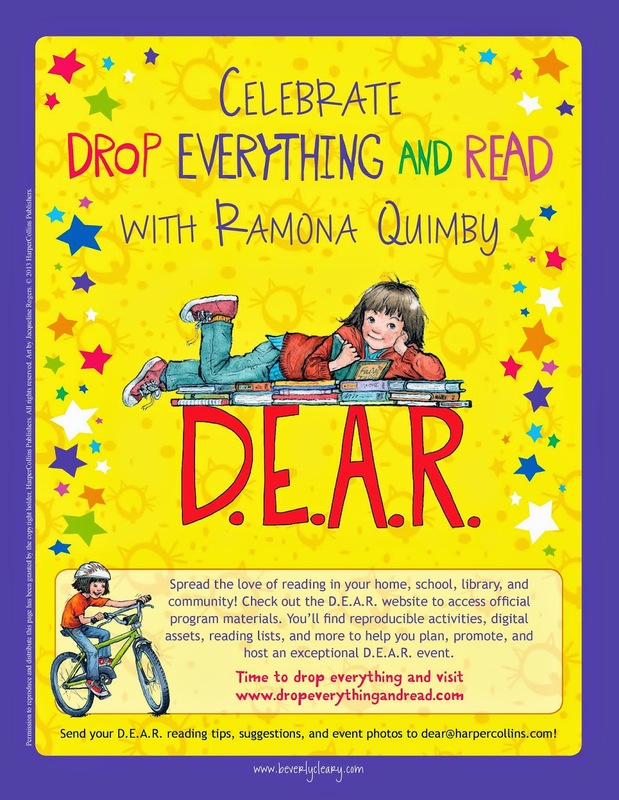 The date of this event was chosen to coincide with the birthday of beloved children's author Beverly Cleary, who featured D.E.A.R.in her book Ramona Quimby, Age 8. Sponsored by groups including the National Education Association (NEA) and the National Parent Teacher Association (PTA), D.E.A.R. has expanded to a month of activities intended to support teachers and parents in instilling the joys of reading in children -- and in taking time for their own reading as well. There is a web page with resources to help parents and teachers encourage reading. As one teacher notes, when writing about how she uses silent reading in her classroom, "The authors of children's literature and their books kids love can tame even the wildest of students, can motivate even when following a tough act like lunch, and can be a teacher's best friend." Whether it is part of a regular classroom activity, a program at your local library, or a bedtime ritual you share with your kids, setting aside a regular time to drop everything and read -- or be read to (preferably with a cuddle, for young children) can build a love of reading that can enrich children's lives forever.